An overview of Jersey City looking eastward. Our compressed version of the Lehigh Valley car float and apron. The Valley had two aprons and floats. Along the dockside we see the USS American Scout. This ship carried steel products created at Bethlehem Steel overseas. 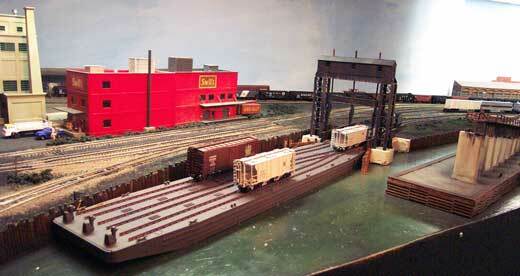 An overview of the CNJ's McMyler dumper and it's pier with kick-back track. Full hoppers are pushed up the hill on the right and into the dumper. The dumper picks the car up and flips is upside down to dump out the coal. Then it rights and lowers the car. When the next full hopper is pushed into the dumper, it forces the empty car out and down the kick-back track to the empties yard. 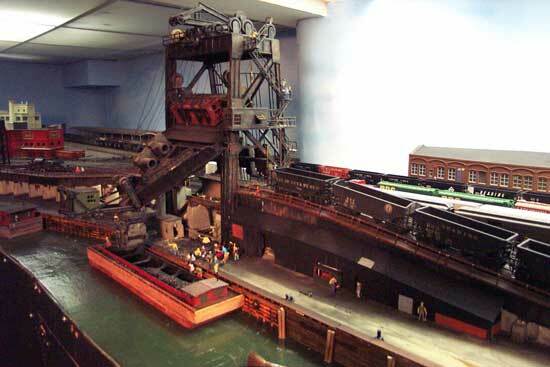 A close-up of the dumper and the coal barge that it loads. 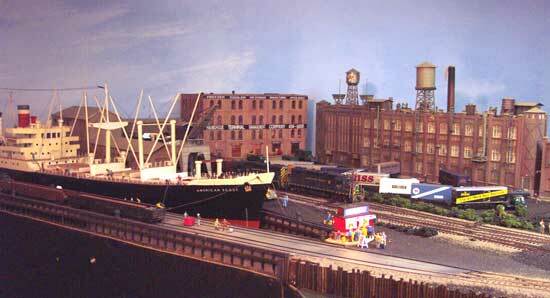 The barge is modeled after a Lehigh Valley 150 foot coal barge. Here, a string of full hoppers is waiting for the dumper to lower to put another loaded hopper in. 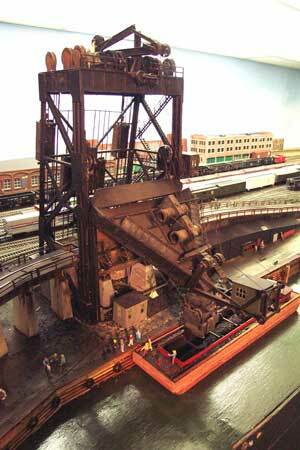 A hopper has just been dumped, and it's coal is loaded into the barge waiting below. The empty hopper is at the top of the dumper. 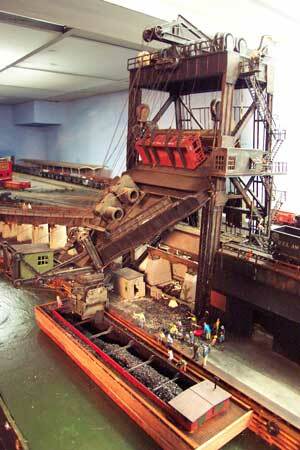 We do dump live coal loads into the barge. When the loader at the Ashley coal breaker is finished, we'll be able to put live coal loads into the hoppers, run them to Jersey City and dump them into the waiting barge.